When it comes to pace of play, tennis players rarely think about the impact their string type provides. Since most racquets are strung in the same manner, the type of string used is placed on the back burner. The type of string makes a huge dent in your ability to evolve with the game. String firmness, playability of the string, string resistance, and other such sub-categories create for many different market variants. The selection process can be narrowed down to your pace of play and broadened to suit the different skill sets the user possesses. Below we will introduce a preemptive buyer's guide that helps you understand the selection types before purchasing. We have also hand selected 8 different products to help you understand the differences amongst product types. Finally, we help answer some of the most popular questions that arise when it comes to tennis strings. What are the best tennis strings for topspin and power? 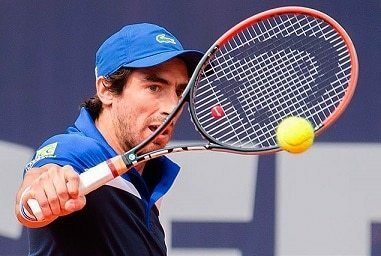 What are the best tennis strings for flat hitters? What are the best tennis strings for juniors? What are the best tennis strings for beginners? 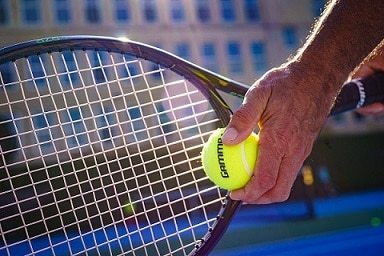 What are the best tennis strings for tennis elbow? Luxilon put consumer concerns at the top of their production when designing their 4G tennis string. This string contains additional strength components that help reduce the need to adjust tensions. The staying power of this string is set to some of the highest standards on the market, making it a popular choice for beginning players and touring professionals alike. This string is designed from co-poly materials, which is a more complex monofilament that helps the user exact their control and command over the ball. This string option produces less friction when facing contact, allowing the user to exercise their right to elements of spin and cross-directional control. This is a string that is designed to keep the user accurate. The dual-fusion of accuracy and limited maintenance keep the price point within reason when comparing to models with like features. Our lone natural gut mention extends to one of the largest names in the game with Wilson. This natural gut model is designed with reinforcements and additives to the production means to help produce components of additional power and velocity. These strings will run a little more firm than your average sets, but remain within reason to entitle the user to control and ease of use tendencies. Since the production utilizes the cow intestines, the feel with these strings remains the most consistent on the marketplace today. This high-end design does come with a high-end price tag, making it the proper fit for the professional and avid player. Head is a brand that is widely known by tennis players, leading their string productions to be nothing short of modeled consistency. This multifilament styling helps to increase your power and control through the thicker combinations of woven fibers. The fibers of this string are also treated with the company's PowerStrip technology. This helps get the RPM of the service speed up and keeps the power element as a staple of your game. The fused fibers are constructed of proprietary combinations that also help these strings stand up the test of time. These models are made in a manner that increases resistance and reduces wear, which is something that is not seen in most multifilament creations. The intended use is for the all-purpose, rounded player. This lends these strings to suit the avid player or the player who has some years of experience playing the game. Keeping with the power discussion, we have an offering from Tourna that keeps your returns and serves in the high-speed ranks. This string is designed using a proprietary polyester blend, which is string type that is often not associated power. The polyester material was developed by German engineers that gave it soft and durable properties, allowing the string to claim the additional power streams. This model also successfully underwent many user tests and passed in flying colors with terms of non-sliding strings and ball control. This allows the user to worry less about the tension adjustments and focus more on developing their spin and counter shot locations. This string is designed for the avid user and is most suited for match play. The lifespan of this string rounds out to about 1-2 months, which is something to say for a polyester blend. There is a lot of hype surrounding the speed component of tennis strings, so it is no wonder that the tennis powerhouse Babolat has created a model to better service players. Their RPM Blast SKU is a monofilament string type that helps the user increase their velocity with little effort. Using proprietary string treatment, Babolat is able to feature a mid-range thickness that keeps control in the discussion with the speed component. It is made from polyester materials, keeping the racquet responsive to each swing you take. It also helps influence your command, allowing you full control over the ball and the ability to apply spins and directional shots. This string type is the perfect fit for the avid player as there is still the tension concern that must be addressed often. Wilson is another name that reaches the top echelon of tennis brands. Their sensation product line produces microfiber tennis strings that help increase the comfort and ease of use for the user. This material is comprised of hundreds of fibers that are layered on top of one another. This helps to keep a firm hold on the strings, making them a proponent to the durability concerns users may have. This is a synthetic gut model that heightens the focus on ease of use, making it a fit for the novice and beginning user. It is a softer fabric that helps the user develop the proper control tendencies needed to take their game to the next level. Use these string types as a practice model or at the beginning and intermediate levels and advance on to other Wilson string types to keep consistency and help your game flourish. Our last two offerings feature similar properties, and both come from the same brand, so we have combined these two into one review. The first inclusion is the HEAD Gravity model. This model takes a hybrid approach to stringing without carrying the terminology. Microfilament strings are used for both the cross and ups/downs, but the shape of the fibers is different. One string is triangular in shape while the other is spherical. This helps to take down control while still hosting the incredible power boost you desire. The HEAD Primal set is does take the hybrid format, combining monofilament strings with microfilament strings. This fiber fusion keeps these strings resistant and increases the ease of use for the user. Both options greatly increase the flexibility the user has when playing, allowing them to pin point the location of their game that they see most viable for improvement. These sets are both good hybrid options for the beginning user or the user on the edge of advancement looking to improve a specific skill set. This video does a good job of introducing the types of strings to the users and helps the user to understand the different properties these strings possess. We will further detail these properties and help categorize these options for the different skill sets a user possesses. Polyester strings are comprised of single strands of materials and do not call for fiber fusion to produce. This helps these strings stand up to durability concerns, lasting much longer than fiber fused models would. Due to the fact that these strands are already a complete model, they allow for greater control on your shots. They are woven into a bed of solidity, keeping the proper catch on the ball when it hits the bed. This control increase also helps the user produce varying levels of spin and can be a sound proponent in helping you develop the drop shot. These strings often lose tension quickly, calling for routine maintenance to keep the hosted properties prevalent and working towards your favor. These are designed for the professional and avid player who understands the different levels of tension in the strings. Natural gut strings were the first tennis string type brought to market. They contain fibers that are fused from cow intestine. Since this main ingredient is something that is not readily available, natural gut strings also represent some of the most expensive options on the market. These string types are less stiff than polyester models, leading to better comfort from shot to shot. They help to absorb the contact, which wears less on your arm and elbow area. They are also a little thicker than polyester strings, outputting more power than the previously described model. It is also more responsive to the player, producing an ample amount of feel. The tension is kept within fused models, due to the many different fibers at work. It hosts extra layers, allowing for additional periods of wear before having to be replaced. This set is utilized by the pros (Nadal, Federer, Djokovic), but it also makes a perfect fit for the user who is looking to play at the casual ranks. Multifilament strings are the synthetic counters to natural gut strings. They are made from hundreds of different fibers that are woven together. They woven fibers produce a thicker string, which helps lead to some of the same properties that natural gut strings host. The power of these strings is increased due to the fiber reinforcement. You also gain a better feel from thicker fibers. The durability is again something that is at risk due to the fiber fusion being the only holding mechanism keeping these strings together. They due suit long-term tension holds due to construction, which is nice for the recreational player that doesn't want to make string adjustments as often. They can also be had at a much cheaper price point than natural gut strings due to the synthetic materials coming in at a more affordable and readily available rate. Synthetic and nylon options fall in between polyester and multifilament strings on the thickness scale. Since the main properties of thickness lead to advantages in power, spin, and control, these strings work to balance these advantages. You don't have to sacrifice an area of your game by purchasing these models. They will also be ready for skill set advancement when you are ready to add spin or the drop shot to your game. The price point of this model is one of the most user friendly on the market, making them the perfect fit for the learning player, novice user, or casual player. Kevlar strings are one of the most durable strings on the market. Kevlar material is used to back resistance from bullets in bullet proof vests, leaving it as one of the greatest resistance options on the market today. This string comes as a complete unit and doesn't rely on fiber fusion to be produced, lending it the opportunity to possess properties that are good for applying spin, producing greater control over your striking, and providing a durable build that will stand up to the test of time. The price point of these strings is in line with synthetic blends, which than leads to the case of whether or not you're looking for a competitive advantage to a certain aspect of your game when purchasing. One other popular method is to hybrid your strings. This is simply using one string type for the up and down coverage and another for the cross hairs. This is a popular practice utilized by most touring professionals. The combinations utilized often blend fiber types with complete models. The fiber types are often utilized at the cross hairs region, mainly to bring that power element to your service or your swing. The synthetic, nylon, polyester, and Kevlar are utilized at the up and down locations. This helps influence the control and the addition of spin to the ball. The only facet that creates a downside for hybrid string combinations is that the user must often work on the tension. 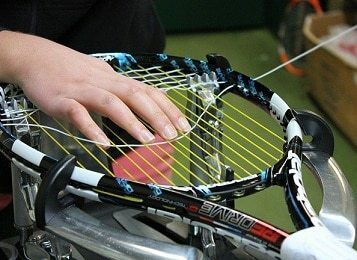 These combinations can cause some problem if the tensions aren't being held in the correct locations, causing for routine maintenance on this stringing technique. After carefully considering all of the products in our review, we have decided to award the Luxilon 4G Tennis String as our clear winner. When it comes to string performance, it is hard to find a multifilament option that boasts a long lease on holding tension, which is something Luxilon smashes. Their strings hold the proper tension due to their resistance technology, keeping the tightness for months at a time. This reduces the hours spent re-stringing or searching for that lost tension amount. It also possesses properties for greater control and some velocity increases, checking off many of the important elements mentioned within our buyer's guide. This makes this product a suitable fit for all facets of game play styles and levels. Any user can gain benefit from this string type, keeping it as our clear-cut winner of the discussion. When it comes to topspin, the best string options are the single strand types. This directly relates to monofilament, polyester, Kevlar, and other such single substance materials. The materials that are built up of fibers slowly fade and breakdown over time, greatly reducing your control and command over the ball. The single strand strings remain consistent and they can also be treated to develop these different spin types. Power is more associated with the fiber designs. These fibers can be reinforced and built-up to withstand greater impacts and producing greater outputs of power. Someone who likes to keep their volleys low and their contact precise would benefit greatly from a fiber-built string type. These string types allow the user to exercise greater amounts of command, which is important for developing a flat shot. They are also greater absorbers of contact, which helps to keep the flight path of the ball lower to the ground. The best tennis strings for the beginning user usually extend from the synthetic and Kevlar spaces due to their lower price range. These strings require less attention when it comes to amounts of tension, which is a learning curve that is often difficult to understand when you are just starting off in the game. These models help the user exercise control and don't work too much with the power and velocity categories, helping to keep pace of play within range of the new learner's capabilities. The beginner discussion extends back to the pace of play discussion. You don't want to have a string that offers a lot of reinforcement for towering blows or is super tight for a fierce return game. You want to keep the discussion within the realm of development and increasing your control and command over the ball. This is where polyester, Kevlar, and monofilament strings live. These three options would make a perfect fit for the beginning user based off of pace and increased control alone. This helps them slowly develop the tendencies to advance onto the drop shots and adding spins, which is another internal component these strings house. 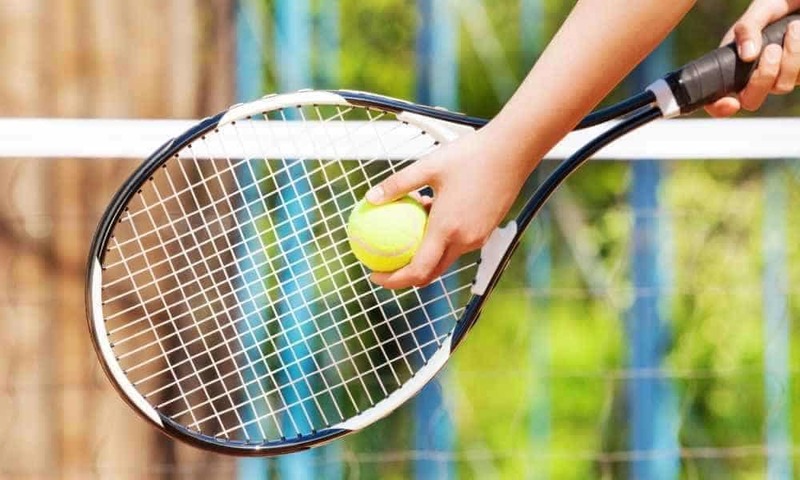 When it comes to tennis elbow and elbow ailments, these developments often extend from a racquet that is strung tightly and features firm strings. Softer strings, usually extending from the fiber space, help to absorb blows and reduce the shock being placed on your arm each time you make contact or swing at the ball.